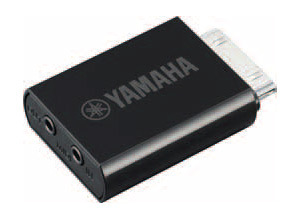 The i-MX1 by Yamaha was just recently announced. It is not yet available but we have some info here from Yamaha. Yamaha introduces the i-MX1 on the Frankfurter Music fair – a MIDI interface that‘s connected to the Apple iPad and thus offering vast possibilities to control MIDI equipment. The Apple iPad has proven itself as a very handy tool, combining a very nice touch panel with a reasonable size. It has sold in large quantities. On Winter NAMM 2011 Yamaha introduced a series of Apps that will allow a wireless controlling of the MOTIF XF Music Production Synthesizer. To be able to control synthesizers that won‘t allow a wireless connection to the iPad, Yamaha now presents a MIDI interface that‘s connected to the iPad. In a small, black device the i-MX1 carries the needed electronics and two connectors for the included adapter cables which represent the MIDI input and output (with the well known 16 MIDI channels each). It does not just connect to the iPad, but to the iPhone and the iPod Touch, too. Since these devices are much smaller, they are even more handy controllers. The i-MX1 is compatible to the drivers provided by the iPad-OS (iOS, Core MIDI), there‘s no need for special drivers. So even thirdparty applications that are using the iOS drivers can use the i-MX1 as MIDI-Interface. The i-MX1 will help the iPad to continue its triumphal procession to the shores of ‘old school’ MIDI.